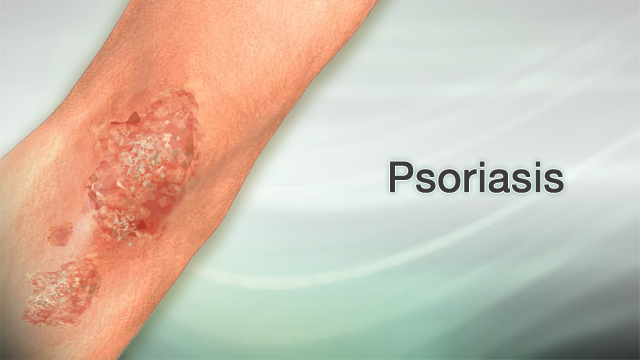 Psoriasis is a skin condition that causes skin redness and irritation. Most people with psoriasis have thick, red, well-defined patches of skin with flaky, silver-white scales. These patches are called plaques. Psoriasis is very common. Anyone can develop it, but it most often begins between ages 15 and 35, or as people get older. Psoriasis isn't contagious. This means it doesn't spread to other people. Psoriasis seems to be passed down through families. Normal skin cells grow deep in the skin and rise to the surface about once a month. When you have psoriasis, this process takes place in days rather than in 3 to 4 weeks. This results in dead skin cells building up on the skin's surface, forming the collections of scales. Psoriasis may be worse in people who have a weak immune system, including people with HIV/AIDS. 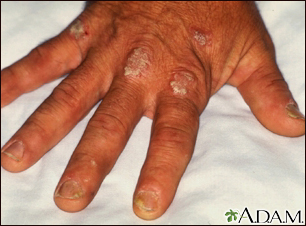 Some people with psoriasis also have arthritis (psoriatic arthritis). In addition, people with psoriasis have an increased risk of fatty liver disease and cardiovascular disorders, such as heart disease and stroke. Psoriasis can appear suddenly or slowly. Many times, it goes away and then comes back. The main symptom of the condition is irritated, red, flaky plaques of skin. Plaques are most often seen on the elbows, knees, and middle of the body. But they can appear anywhere, including on the scalp, palms, soles of the feet, and genitalia. Guttate -- Small, pink-red spots appear on the skin. This form is often linked to strep infections, especially in children. Inverse -- Skin redness and irritation occur in the armpits, groin, and in between overlapping skin rather than the more common areas of the elbows and knees. Pustular -- Yellow pus-filled blisters (pustules) are surrounded by red, irritated skin. Your health care provider can usually diagnose this condition by looking at your skin. Sometimes, a skin biopsy is done to rule out other possible conditions. If you have joint pain, your provider may order imaging studies. Skin lotions, ointments, creams, and shampoos -- These are called topical treatments. Pills or injections that affect the body's immune response, not just the skin -- These are called systemic, or body-wide, treatments. Phototherapy, which uses ultraviolet light to treat psoriasis. If you have very severe psoriasis, your provider will likely recommend medicines that suppress the immune system's faulty response. These medicines include methotrexate or cyclosporine. Retinoids, such as acetretin, can also be used. This is treatment in which your skin is carefully exposed to ultraviolet light. It may be given alone or after you take a drug that makes the skin sensitive to light. If you have an infection, your provider will prescribe antibiotics. Taking a daily bath or shower -- Try not to scrub too hard, because this can irritate the skin and trigger an attack. Oatmeal baths may be soothing and may help to loosen scales. You can use over-the-counter oatmeal bath products. Or, you can mix 1 cup (240 mL) of oatmeal into a tub (bath) of warm water. Keeping your skin clean and moist, and avoiding your specific psoriasis triggers may help reduce the number of flare-ups. Relaxation and anti-stress techniques -- The link between stress and flares of psoriasis is not well understood. Some people may benefit from a psoriasis support group. The National Psoriasis Foundation is a good resource: www.psoriasis.org. Psoriasis can be a lifelong condition that can be usually controlled with treatment. It may go away for a long time and then return. With proper treatment, it will not affect your overall health. But be aware that there is a strong link between psoriasis and other health problems, such as heart disease. Call your provider if you have symptoms of psoriasis or if your skin irritation continues despite treatment. Tell your provider if you have joint pain or fever with your psoriasis attacks. If you have symptoms of arthritis, talk to your dermatologist or rheumatologist. Go to the emergency room or call the local emergency number (such as 911) if you have a severe outbreak that covers all or most of your body. There is no known way to prevent psoriasis. Keeping the skin clean and moist and avoiding your psoriasis triggers may help reduce the number of flare-ups. Providers recommend daily baths or showers for people with psoriasis. Avoid scrubbing too hard, because this can irritate the skin and trigger an attack. Gordon KB, Blauvelt A, Papp KA, et al; UNCOVER-1 Study Group, UNCOVER-2 Study Group, UNCOVER-3 Study Group. Phase 3 trials of ixekizumab in moderate-to-severe plaque psoriasis. N Engl J Med. 2016;375(4):345-356. PMID: 27299809 www.ncbi.nlm.nih.gov/pubmed/27299809. Lebwohl MG, van de Kerkhof PCM. Psoriasis. In: Lebwohl MG, Heymann WR, Berth-Jones J, Coulson IH, eds. Treatment of Skin Disease: Comprehensive Therapeutic Strategies. 5th ed. Philadelphia, PA: Elsevier; 2018:chap 210. Van de Kerhof PCM, Nestlé FO. Psoriasis. In: Bolognia JL, Schaffer JV, Cerroni L, eds. Dermatology. 4th ed. Philadelphia, PA: Elsevier; 2018:chap 8.